Japan’s Proximate Object Close Flyby with Optical Navigation (PROCYON) has been lost in space ever since its ion thrusters blew out in 2014. Since then, the tiny spacecraft has done its best to be useful, orbiting the Sun by itself. A new study reveals the PROCYON made some impressive observations on Comet 67P/Churyumov-Gerasimenko, the same comet the Rosetta spacecraftobserved for two years before ending its mission in 2016. In September 2015, an international team of researchers used PROCYON’s LAICA telescope to observe Comet 67P while Rosetta was still inside the cloud surrounding the nucleus of the comet, called the coma. 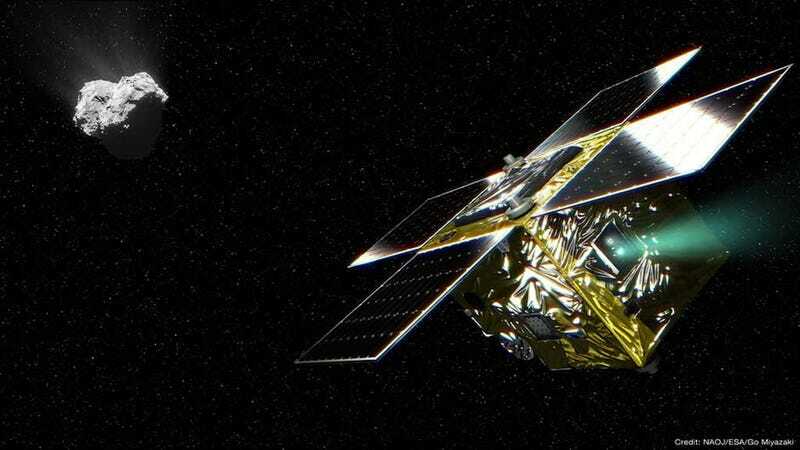 The micro spacecraft happened to be in the right place at the right time—though the researchers weren’t planning to use PROCYON to observe Comet 67P, at the time, it had a better view of the comet than Rosetta. For this reason, it was able to accurately measure the amount of water discharge on the comet. The researchers’ findings have been published in the February 2017 edition of The Astronomical Journal. “The water production rate of a comet is one of the fundamental parameters necessary to understand cometary activity when a comet approaches the Sun …because water is the most abundant icy material in the cometary nucleus,” researchers wrote. By studying the quality and quantity of water on comets, we might better understand the origins of water on Earth. It’s long been hypothesized that a barrage of meteorites crashing into Earth could be responsible for some of the water on our Blue Marble. More generally, studying the activity on the surface of comets can shed light on how these mysterious balls of ice and rock have evolved over the history of the solar system. The team was able to take its measurements and use them test out water production rates on a coma model, which allowed them to confirm an intriguing relationship: the closer an object is to the Sun, the higher its water production rate. It’s a big achievement for a wayward spacecraft. According to the research team, these measurements mark the “first scientific achievement by a micro spacecraft for deep space exploration.” Because micro spacecrafts are remarkably cheaper than their larger siblings, the team hopes this feat will be a “model case” to inspire more micro spacecraft missions.